First Line: "There's no Santa Claus," Charlie said. A few years back, Chet grabbed Plumpy Bonaparte by the pant leg so his human partner Bernie could send Plumpy off to jail for running a Ponzi scheme. Now Plumpy is a free man, the owner and operator of a business called Santa 365, and completely reformed... or so he says. Plumpy may be reformed, but he's still able to hoodwink Bernie into paying for an elaborate Christmas party. There's only one immediate problem: Chet doesn't like the elf who shows up to take charge of the shindig. You see, the elf smells way too much like earwax. 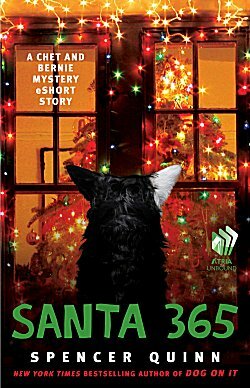 This digital Christmas short story has many of the things fans of Spencer Quinn's Chet and Bernie series love, but there are a couple of little hiccups. One is the fact that the story is actually too short and doesn't allow for Chet's narrative skills to really shine. The second problem is the larger of the two. I've never seen Bernie be so gullible. I don't know if he was trying to lull the crook into a false sense of security, or if he'd taken leave of his senses for the holidays. Despite the two things I mentioned, this is still a nice little Christmas story. I give it two tails up-- because two is the best number (according to Chet). Sounds like a cute story, Cathy. Even if it's not perfect, it may be just right for a cup of cocoa and the fireplace, so to speak.